Yesterday, Verizon added tablets to its monthly device payment plan, also known as Edge. With tablets on Edge, you are looking at the same deal as you would get with phones – no upgrade fees, full device value split into 20 equal monthly payments, and the option to upgrade once you have owned the device for 30 days and have have paid off 60% of it. As you can see from the screenshot, devices like the new Sony Xperia Z2 Tablet are already included. 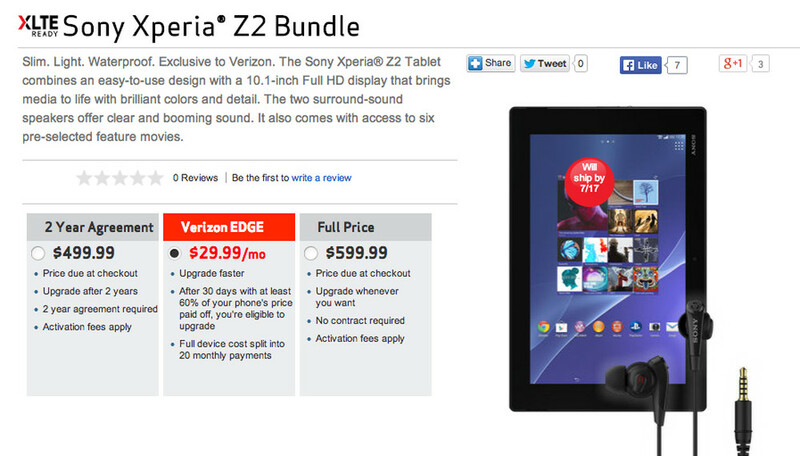 Verizon also sells the Galaxy Tab 4, G Pad 8.3, Nexus 7 (2013), Galaxy Note Pro 12.2, and all of the iPads. If you were looking for a way to get into an LTE-ready tablet that works on Verizon’s network without paying the full cost up front, you now have one.